The version of the engine that the asset works with. Currently, it's not possible to have a single asset entry contain downloads for multiple engine versions, so you may need to re-submit the asset multiple times, with an entry for each Godot version it supports. This is particularly important when dealing with major versions of the engine, such as Godot 2.x and Godot 3.x. The version number of the asset. While you are free to choose and use any versioning scheme that you like, you may want to look into something such as SemVer if you want your asset's versioning scheme to be clear and consistent. Note that there is also an internal version number, incremented every time the asset download URL is changed or updated. The URL to your asset's files/webpage. This will vary based on your choice of provider, but it should look similar to https://github.com/<user>/<project> . 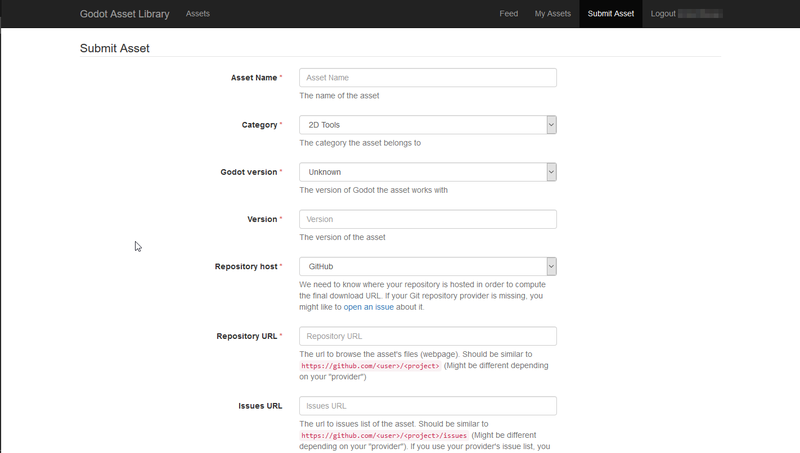 The URL to your asset's issue tracker. Again, this will differ from repository host to repository host, but will likely look similar to https://github.com/<user>/<project>/issues . You may leave this field empty if you use your provider's issue tracker, and it's part of the same repository. The URL to your asset's icon (which will be used as a thumbnail in the AssetLib search results and on the asset's page). Should be an image in either the PNG or JPG format. You may also include up to three video and/or image previews, which will be shown at the bottom of the asset page. Use the "Enable" checkbox on each of the preview submission boxes to enable them.